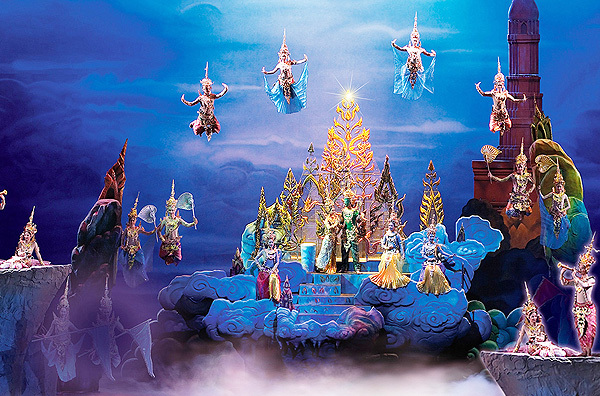 Enjoy Siam Niramit Show – World class spectacular performance of Thai Art and Cultural Heritage. 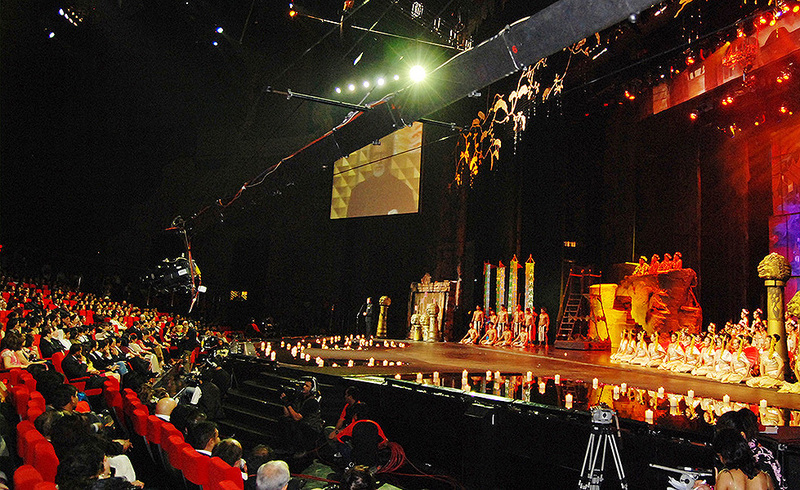 This must-see spectacular is performed on the gigantic stage now listed in the Guinness World Records, featuring over 150 performers with as many as 500 costumes. On top of this, enhanced special effects with the world’s most advanced technology are used to produce a stimulating, very realistic and inspiring experience. This is a Journey to the Enchanted Kingdom of Thailand that no one can miss. Siam Niramit cultural show provides for an entertaining night out and a chance to get some insight in Thai culture and history as well as local beliefs and religion. 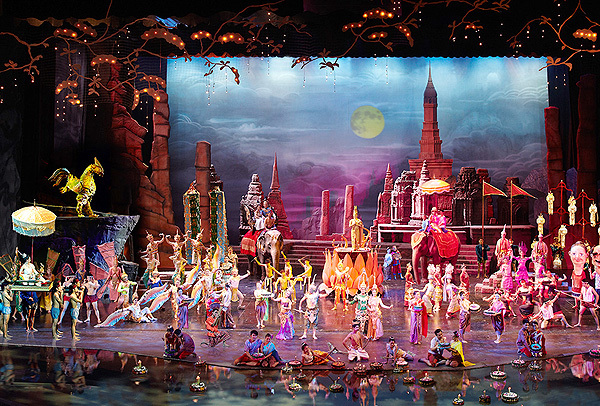 150 Performers wearing beautiful and colorful costumes perform an engaging stage show featuring a realistic scene with boats sailing on a river, war scenes with sword fights, canon shots and a war elephant and many other impressive scenes. Meet creatures from Thai mythology, see a depiction of Heaven and Hell and watch Muay Thai boxing fights, the combat techniques used by the Siamese army in gone by times. Arrive at least an hour before the start of the show to have a look around the Thai village and to watch a traditional Thai dance act outside on the courtyard. Around the courtyard is a replica rural village with paddy fields and traditional houses from various regions of Thailand. The people wear clothing of each region, like the colorful dress of the hill tribes people from the North. At the houses you can see the daily life of people in gone by times as well as Thai customs and way of life. 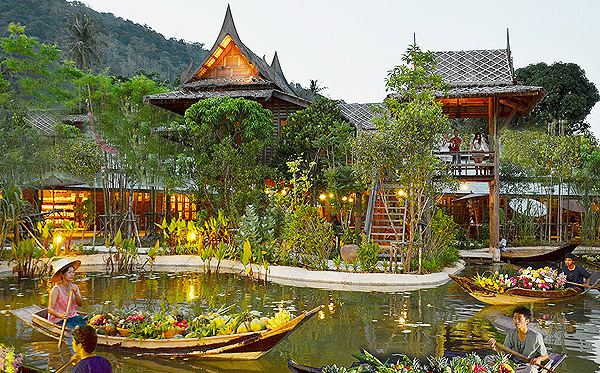 Watch demonstrations of traditional crafts like weaving silk or see how traditional Thai food is prepared and sample some when it is ready. Meet the Hun Lakhon Lek, the Thai puppets used in the old days to tell Thai folk tales, take a long tail boat ride on a small khlong (canal) or feed the large fish in the pond. 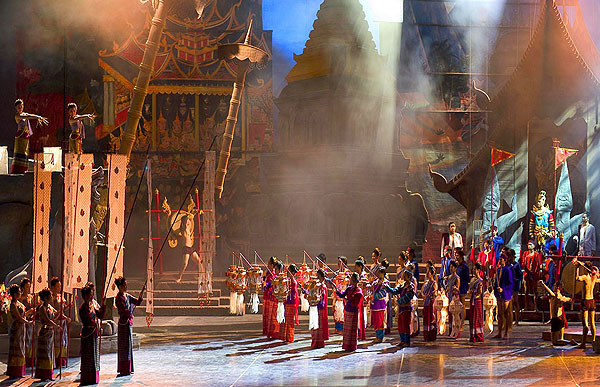 Siam Niramit cultural show is an engaging 80 minute show performed on a very large stage measuring 65 meters wide, 40 meters deep and 12 meters high in an air conditioned theatre. 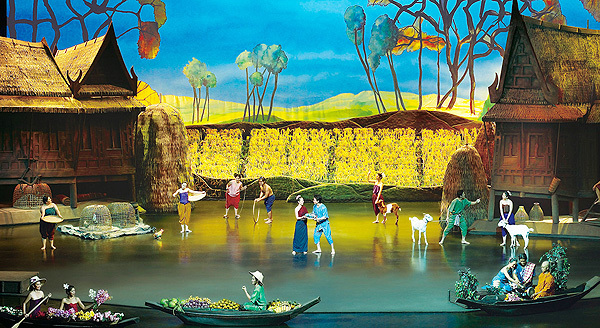 150 Performers wearing beautiful, colorful costumes present an entertaining show with dance and music accompanied by special effects as thunder and lightning. With every act there is a scene change. Act 1: Journey back into history. Meet the civilizations of the North, Central, North East (Isan) and the South. 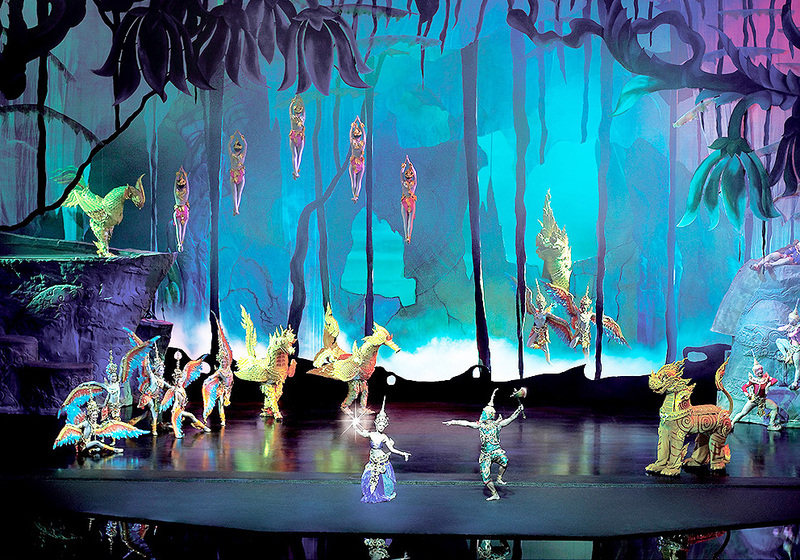 Act 2: Journey behind imagination: The three worlds (Heaven, Hell and Himmapan forest). See angels from the Heavens portrayed by dancers suspended from the ceiling and scenes from Hell with demons and torture. See the punishments that sinners receive who have committed sins as adultery and lying. Meet the mythical creatures that live in the legendary forest Himmapan. Act 3: Journey through joyous festivals. 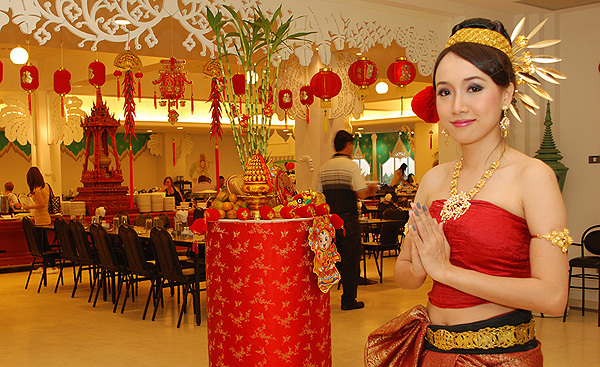 During the last act you will get to know Thailand’s festivals such as Songkran (the water festival) and Loy Krathong as well as important Buddhist events such as ordination into monkhood. Scenes take place in various regions of the country. From the North you will see a Royal procession from the days of the Northern Kingdom Lanna, the fingernail dance and sword dance. From the South a performance of shadow puppets and a market scene with foreign traders in Srivijaya, an ancient Kingdom in the South. 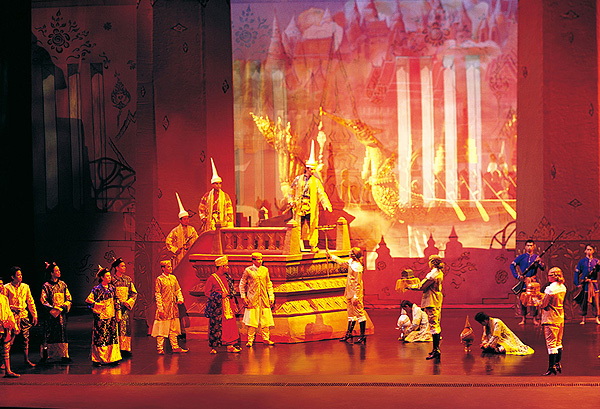 In the North East a scene that takes place in Ayutthaya, once one of the most powerful and richest places in the world. Also a bamboo dance and several folk songs as well as Muay Thai boxing fights, in ancient days the form of combat used by the Siamese army. For children under 90 cm. height will be Free of charge. For children under 140 cm. height we charge 75% of the price that calculate from a total number of adult pax. For children over 140 cm. height we charge normal price.